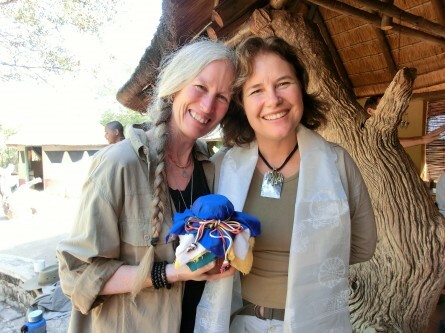 In May 2011, the Earth Treasure Vase Global Healing Project traveled to South Africa to bury our 24th Earth Treasure Vase. Our traveling sangha reconnected to our deepest roots while stretching to meet energies and mysteries beyond our limited understanding. In going, we cultivated a collective intention to awaken a spirit of service and heartfelt prayers for the healing, protection and renewal of the Earth. 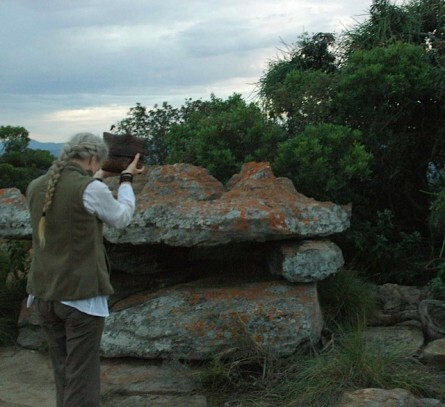 We were blessed to have as our consummate and supremely knowledgeable guide, Stuart Gedrim, a specialist in the sacred sites of South Africa who received close mentorship and training from African High Sansui and Zulu Shaman, Credo Mutwa. 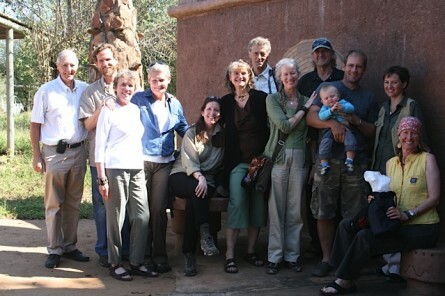 Our group included Open Way Sangha members, Barbara and Ted Seeley; ETV/Alliance for the Earth board member, Ellen Wingard; longtime friend, Linda Osborne; Sensei Beate Stolte, Co-Abbot of Upaya Zen Center; ETV project development director, Judy Herzl; and Dr. Hugh Wheir, veterinarian and founder of Animal Alliance. Leslie Temple Thurston, spiritual director of Corelight, and her partner, Brad Laughlin, graciously invited us to come to South Africa with the ETV practice. They joined us for much of the trip and introduced us to the land and animals they know and love. We are very grateful to Leslie for her illuminating perspective and to Brad who generously filmed our pilgrimage ceremonies and experiences. Corelight’s Victoria More also contributed her lovely presence to our circle. We began our pilgrimage by visiting the Sterkfontein Caves, one of the primary sites where fossils of australopithicus humans have been found. These remains have provided the missing link between our cousins, the apes, and homo sapiens. This region, outside Johannesburg, is known as the “Cradle of Humanity,” where the great experiment of human life on Earth seemingly all began. After this introduction, our journey took us first and foremost to the Kalahari to meet the San Bushmen, the oldest indigenous culture still alive on the planet. 60-100,000 years ago these extraordinary hunter-gatherers thrived in southern Africa, living in peace and harmony under the stars. 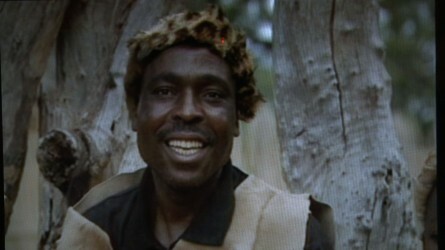 Today in South Africa, only a few communities still hang on to their culture. They have suffered centuries of oppression and injustice, and now live in reservation-like conditions. Through Claire Barry, our liaison to this community, we brought the ETV to the San and were deeply honored that they agreed to meet with us in two special ceremonies. Receiving their prayers and blessings into the vase brought potency to our practice and created a meaningful link for our pilgrimage to these extraordinary people. To learn more about the San, please click here to visit their website. Expert trackers, Jan and Gert, led us out into the bush and guided us to a sacred tree where women with babies, excited young leaders, and a few elders waited for us on top of a nearby hill. After introductions, we rang the bell and passed the Earth Treasure Vase around the circle to receive the prayers and offerings of all. The bell’s pure sound connected us in a resonant field and over the next few days, our friends often asked to hear the sound of the bell, reminding us to stop and return to our breath. Such a simple practice became new again in their presence! 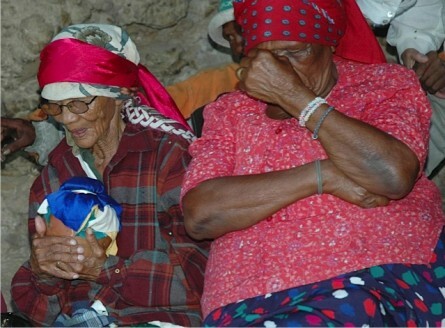 The second ceremony was held in a cave where the oldest member of that community, Ouma !Nas, had witnessed terrible atrocities as a child. The cave has since become a place for healing ceremonies and it was here that we gathered to share the ETV practice. Ouma !Nas blessed the vase in her native tongue and several other grannies also contributed strong prayers while Jan sang a beautiful song with everyone harmonizing with him. Afterwards, we drank tea and ate delicious bread cooked over an open fire, giving thanks to be together in this way. Back in Johannesburg, we visited the Apartheid Museum and township of Soweto, attempting to understand the heartbreaking history of South Africa and how, today, the country is rising out of the unfathomable grief and devastation to be an inspiring example of change for the continent and the world. Equality. Reconciliation. Dignity. Diversity. Respect. Tolerance. These words are lived out through the leadership of Nelson Mandela and many others in the great experiment that is South Africa today. Much transformation has occurred, yet there is much that must still take root to overcome the injustice that lingers on. Our numerous ETV ceremonies provided the opportunity for various communities, government representatives, and tribal leaders to make prayers for unity and compassionate dialogue, the reduction of crime and corruption in their country and for the end to the AIDs epidemic. We all prayed that the national elections, to be held on our last day in South Africa, would provide an opportunity for such change to happen at the local level. From the oldest human culture on Earth, we journeyed on to pay our respects to the animals. The experience of witnessing the great herds in Kruger National Park, where the animals roam free on vast tracts of wild land was life changing. 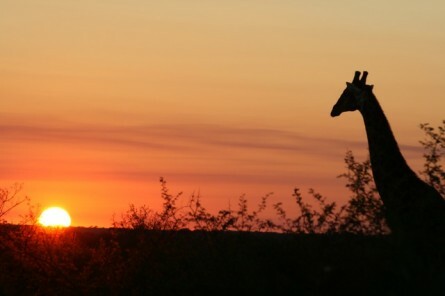 Giraffe, zebra, wildebeest, elephant, rhino, lion, leopard, kudu, impala, hippo, and birds like the lilac-breasted roller and the spotted eagle owl, are but a few creatures in the great kin-dom that inhabits this primordial landscape. We wanted our prayers for the healing of the Earth to include these “indigenous” beings as well. In Kruger, we meditated in the expansive quiet and attempted to enter the animal dreamtime, calming our minds to hear and receive their messages. 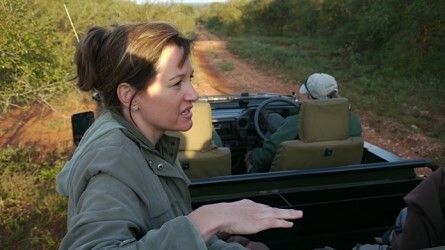 At the incredible Makalali Game Reserve, we met one of Hugh’s colleagues, Audrey Delsink, an elephant researcher well on her way to joining the ranks of other elephant specialists like Cynthia Moss and Katy Payne. 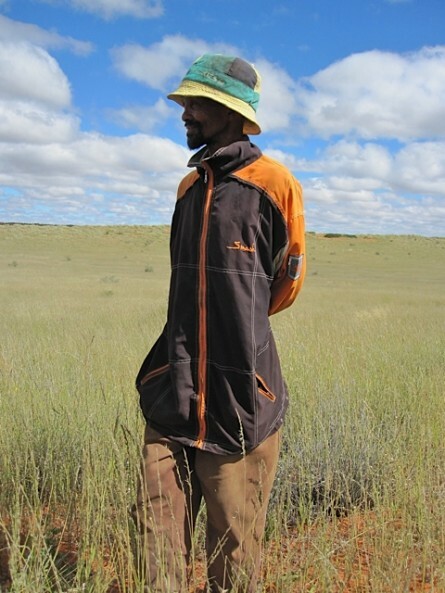 ‘Auds’ has lived at Makalali with the same elephants for over ten years and pioneered the use of a non-hormonal contraceptive vaccine to control the size of elephant herds in the wild. Please click here for more information about the Makalali Research. Information about Auds’ groundbreaking work can also be found at the Humane Society International website. Elephants need vast tracts of land to survive in the wild; however, more and more land is being consumed by human greed and development. 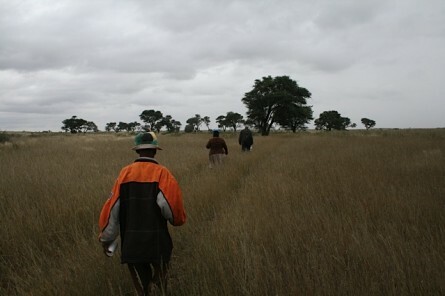 At Kruger, inhumane ‘cull’ killing is seen as the only way to keep herds at manageable sizes, but Auds is proving there is a viable alternative. For ten years, the female ellies at Makalali have received a non-hormonal contraceptive vaccine with no negative side effects or behavioral changes. If the vaccine is not given annually it becomes reversible and the females may become pregnant. The herds can grow naturally and manageably. Happily, we learned that thanks to the Humane Society International, Auds and her team have just received the funding to continue this research for another ten years —making this the longest elephant study of its kind in the world. An extraordinary video about the elephants and Auds’ research, made by Brad Laughlin, can be viewed here. 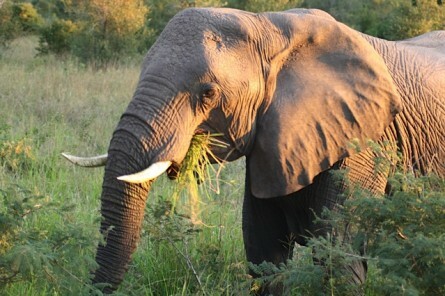 Auds guided us to the ellies feeding in the bush. We met some of their youngsters, and brought the Earth Treasure Vase into their midst sincerely praying that they will survive these dangerous times and continue to bless the Earth with their magnificent presence. 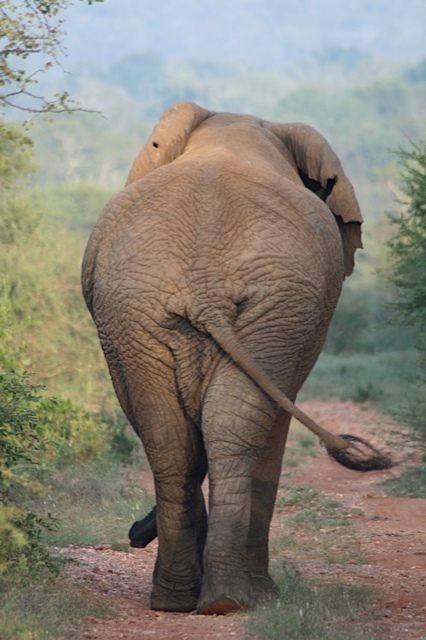 We also hope that Auds’ important research, in connection to everything we know about elephant societies and their intelligent behavior, will prove once and for all that killing elephants to control herd sizes is completely unnecessary…and inhumane. 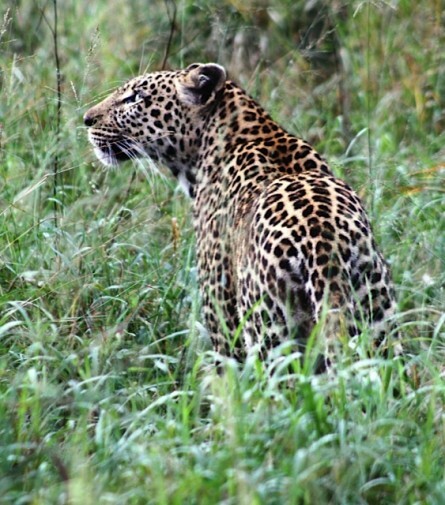 There are many serious threats to animal welfare in South Africa. We learned from another of Hugh’s colleagues, Marcelle Meredith, Director of the South Africa National SPCA, that the abuse of elephants and many other wildlife species is a lucrative and dangerous trade that she and her team are trying to stop. To learn more about the work of NSPCA and its efforts to confront animal cruelty, please click here. A dangerous mafia in illegal wildlife trade, ever increasing poaching, and an attitude of human superiority prevails. Auds and Marcelle, along with others, are constantly on guard to protect the animals — even in the so-called ‘protected’ reserves. There is a war fueled by greed and ignorance that is, to this day, still being enacted at the expense of the animals. 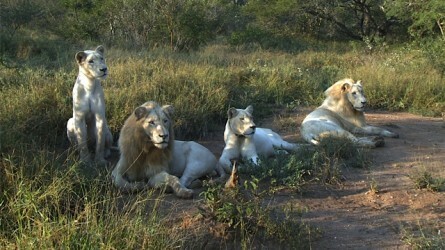 This can be seen most vividly in relationship to the highly endangered white lions. At the Global White Lion Trust, we visited with visionary Linda Tucker and her partner, lion biologist Jason Turner, who are attempting to bring the white lions back from extinction and re-introduce them into the wild in their natural home at Timbavati. The practice of “canned” hunting is a thriving business in this region, where the most valuable ‘trophies’ in the world, the white lions, are bred in captivity and hand raised, only to be shot in fenced enclosures…until there are no more left in the wild. 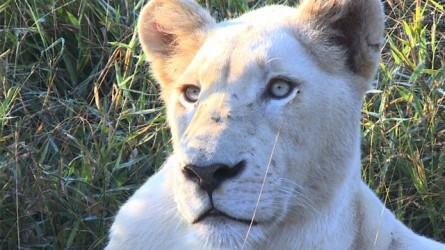 Linda and Jason are working to change this gruesome situation and have established a reserve for the white lions. According to many African traditions, these magnificent animals are considered sacred and their return to the wild, the fulfillment of ancient prophesies. Please visit the Global White Lion Trust to learn more. Never in all my life have I seen a more beautiful vision than these lions: Zirah, the matriarch, lying in a shaft of moonlight and gazing at us in a state of relaxed ease for what seemed like a endless moment of grace surrounded by her almost fully grown youngsters. 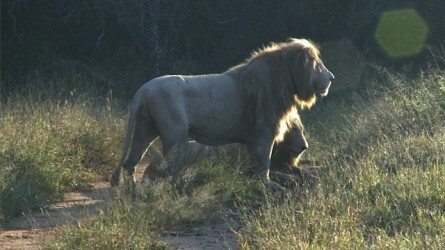 Or dawn’s first rays of light on the mane of her mate, Mandla, his breath rising around him like an aura in the sun. Linda, who is initiated as a lion “sangoma” or carrier of their powerful healing medicine, enabled us to come into communion with the lions and receive a powerful transmission of pure presence like nothing I have ever known. It was a teaching of the kind of power and courage that can only come from the pure heart of love. I felt the lions to embody a quality of true leadership that can guide our way forward today, if we are open to learning from them. Allowed into their midst, it was as if we were having an audience with a community of enlightened masters. They seemed to appreciate our presence, and in an unusual act of interspecies communication, they surrounded our camp and roared their message to us all night long! Thanks to the efforts of Linda and Jason, we held an ETV ceremony at the White Lion Trust and were joined by many members of the local Shangaan community, including Chief Axon Khosa and his sister Sarah, a diviner. It was their aunt, Maria Khosa, Queen of the Lions of Timbavati, who initiated Linda Tucker into this path of fearless healing and enlightened leadership. As the ETV was passed around the circle in the glow of the fire and people made their heartfelt prayers, the lions roared, participating in our ritual by adding their voices to ours at many key moments. We were told that this was highly unusual. For me, it was a dream come true! Government officials, community representatives, families, young people, all of us and the lions, woven together in kinship after sharing our most intimate prayers for the wellbeing of the land. Later we celebrated with a fabulous feast under the stars. To express our condolences and show our support, we encourage everyone to make a donation of any amount in honor of Chief Axon Khosa. Online, tax-deductible donations can be made through Corelight here and will be directed to either the Khosa family or to the White Lions. Please designate this as a gift “in honor of Chief Axon Khosa” and where you would like it to go when you make your contribution. We thank you very much. Our ceremonies and peace-building continued in Acornhoek, near the village of Chief Khosa and his family. 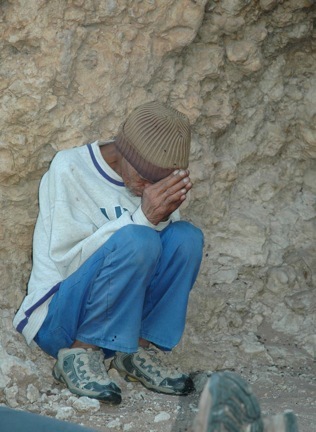 Acornhoek is a sprawling community of more than a million, where one in three people have AIDs and poverty is rampant. 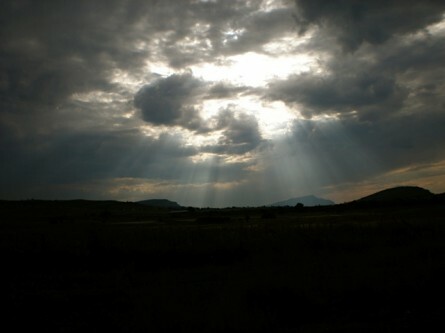 Corelight has several humanitarian projects in Acornhoek, called Seeds of Light. 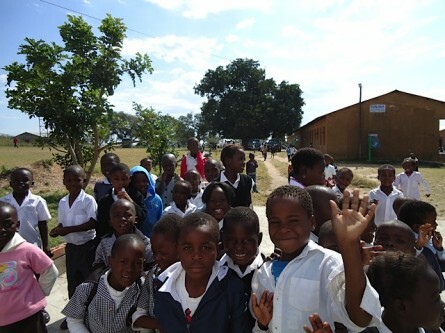 These include a primary school, a day care center and a women’s weaving cooperative. Learn more about Seeds of Light here. We were invited into a 4th grade classroom at the primary school and, after ringing the bell and breathing together for peace, every child in the class (many of whom are AIDs orphans), held the vase and offered their wishes for the future — moving us to tears. 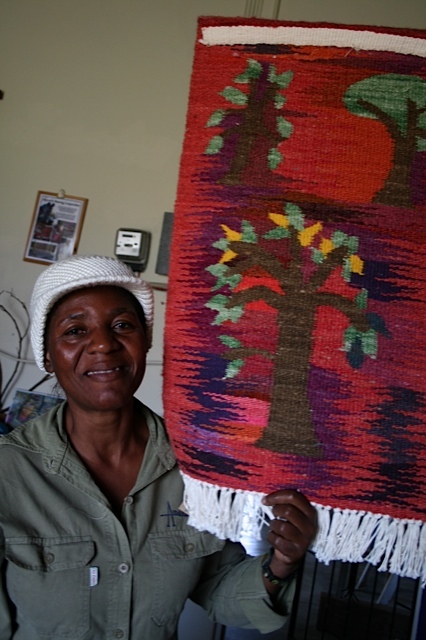 Then, we were grateful to meet with a community of women who are empowering each other and revitalizing their lives through the wonderful Mapusha weaving cooperative. These incredible women prepared a delicious meal for us, then danced and sang songs with beautiful harmonies that spoke louder than words. We shared the ETV with them too and felt deeply moved to include their prayers in the vase — now completely full and ready to be buried! 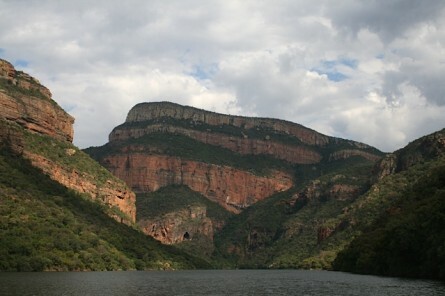 After traveling all over South Africa, inviting the prayers and blessings of the San Bushmen, the wise elephants, the sacred white lions, Chief Khosa and his community, Grandmothers, young children and everyone else all along the way, we finally brought the Earth Treasure Vase to the Blyde River Canyon. This region is on the Nilotic Meridian, a “river of gold” that runs the length of the African continent from South Africa to the Pyramids of Giza and the Great Sphinx, and mirrors the “river of stars” (or Milky Way) above. The more we opened our hearts and minds to the unseen world of Spirit during the course of our pilgrimage, the more the mysterious knowledge that created so many sacred sites and temples in Africa (and the world) truly seemed accessible. Our ancestral memory had been strongly activated through the animals, the indigenous cultures, and the ancient sites we visited. We came to realize that we are all from Mother Africa. The morning of May’s full moon, we held our final ceremony and sealed the vase forever, wrapping it in a white cloth woven by the women in Acornhoek and nestled in a sturdy basket. At the exact time of the full moon, a moment shared by the whole Earth, we took the vase into the center of the canyon and meditated on the water, feeling the energies of the place swirl around us powerfully. 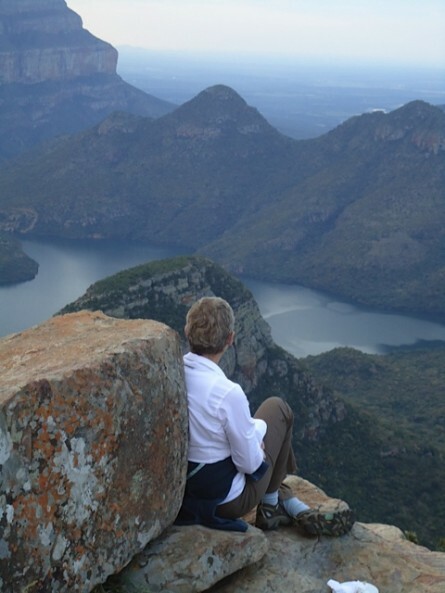 Stunningly beautiful, the Blyde River Canyon truly seems to act as a vortex. Here, we felt the energy of our prayers for the balance and harmony of the whole Earth connect into the Nilotic Meridian and strengthen our global network of sacred intention. Later, as the sun set red on the horizon and the moon rose over our heads, we stood before an ancient stone altar high above the rim of the canyon. This altar, revered and actively used for initiation by Credo Mutwa and others, could not possibly have been formed naturally. Like other such ancient sites on the Nilotic Meridian it seems that our ancestors had capacities we only dream of. All I know is that standing there, it suddenly seemed that the vase and the global ETV mandala we have been creating for 20 years was linked to energies never before imagined. Overcome by momentary silence, one by one we bowed down. We offered the vase at the altar and asked permission of the local guardian spirits to dig a hole. We all felt the powerful energy and agreed: the community was in harmony. This was the place. We had the permission we sought. Chanting mantras and praying with one voice, we dug a deep hole and placed the vase into the Earth. Covering it carefully and placing a large stone on top, a gentle, auspicious rain began to fall and we knew our prayers had been received. The blessings flowed into the Earth and the vase was free to do its job undisturbed for all time. The moon peeked out from behind the clouds and the stars above us shone brightly. We bowed our heads at the stone altar for the last time, giving thanks for the opportunity to join our hearts with others all around the world in a timeless prayer of healing and protection for South Africa and the Earth. May it be so! This entry was posted on Sunday, July 10th, 2011 at 10:59 pm	and is filed under Burials. You can follow any responses to this entry through the RSS 2.0 feed. Thanks for sharing this little known but ever present side of South Africa with the world. May all the prayers manifest! Thank you, Soozi, and thank you for your good work on behalf of the earth. This was an incredible project, thank you for sharing it with me, it moved me in wonderful ways. May good things always follow you. Smiles. Paul, Actually this doesn’t sound like the VBI tagging used for the prmoos. Instead of inserting TiVo-specific content into line 21, this patent refers to using data that is already there CC & ETV and hashing that data to produce a unique signature. So you’d be able to mark sections of *any* program, without needing to insert the flag ahead of time. So this does seem to be different from TiVo’s own prior art. I think Davis was in error when he referred to the promo system in the TiVo today as that uses the Line 21 tagging and not this hashing system.